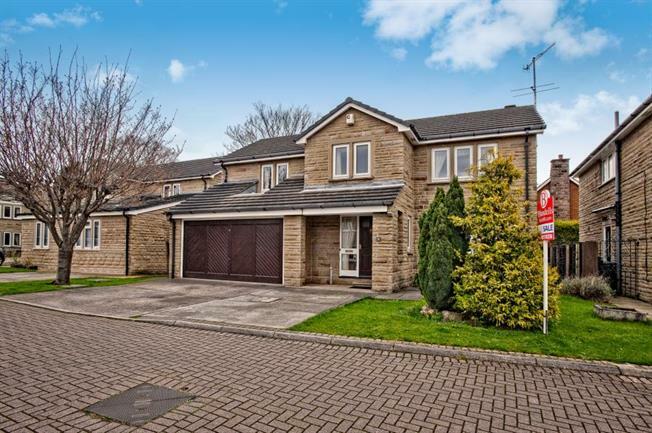 4 Bedroom Detached House For Sale in Rotherham for Guide Price £400,000. GUIDE PRICE 400,000 to 425,000 STUNNING FAMILY HOME! GENEROUSLY PROPORTIONED! CONTEMPORARY! attractive gardens, driveway and GARAGE! NO CHAIN! Blundells are excited to have on offer this stunning four bedroom detached home in the ever sought after area of Whiston. Close to amenities, desireable local schools, open countryside walks, transport links and easy access to motorway networks. The property briefly comprises: entrance foyer, open lounge diner, kitchen, four good size bedrooms, family bathroom, en-suite to master bedroom, double garage and rear enclosed garden. Book your viewing today! Front porch onto entrance hall with balustrade staircase leading to first floor landing, central heating radiator and front facing window. White suite comprising Low flush WC and vanity wash basin, central heating radiator and extractor fan. Front facing window with dual aspect through to the rear patio style doors, feature fireplace and central heating radiator. Rear facing window and central heating radiator. Matching wall and base units, tiled splashbacks, resin sink and drainer, space for hob and cooker, rear facing windows and glass panelling on upper cabinets. Door through to utility area. Plumbing and space for automatic washing machine, rear facing window and side exit door. Spindle staircase, access to the loft, airing cupboard and front facing feature window brightening up the staircase. Rear facing window with fitted wardrobes and door leading into en-suite. Shower cubicle, low flush WC, pedestal wash basin and side facing frosted window. Front facing window and central heating radiator. Built-in storage cupboard, front facing window and central heating radiator. Rear facing frosted window, white suite comprising, bath, low flush WC and pedestal wash basin. Front and rear gardens. Fully enclosed rear garden with hedges and fencing , lawned area, patio seating area and flower beds.